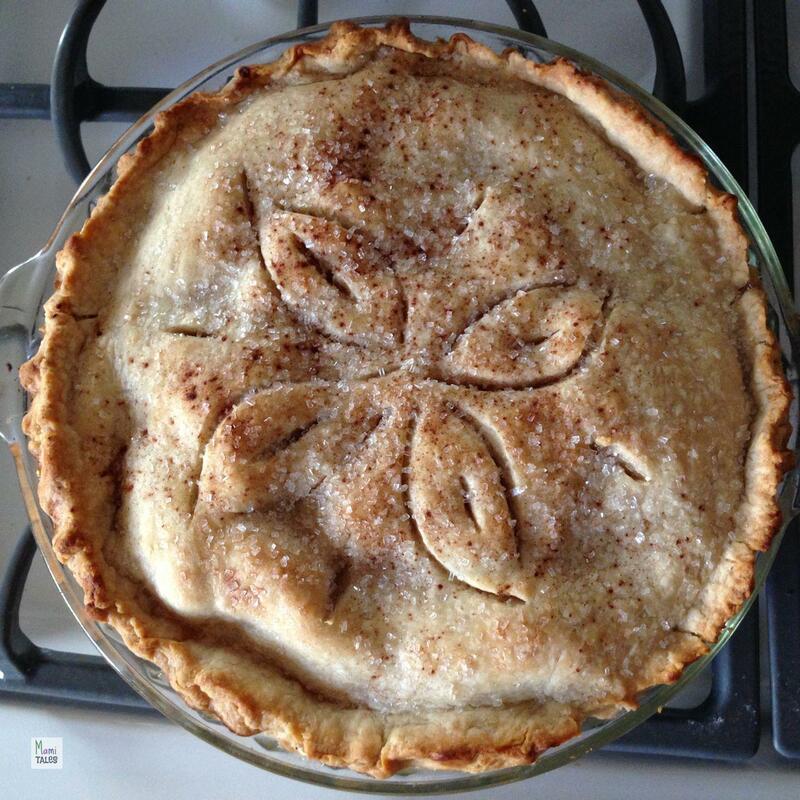 Little Miss I has been pinning to learn how to make her first apple pie. She asked me a couple of weeks ago to incorporate that to our Friday cooking class. She really wanted to do it last Friday, but it was Halloween… She even tried to fake a note in order to make this happen before! However, I had already put a hold on Amelia Bedelia’s First Apple Pie at the library, and the book wouldn’t be there for us on time. But this week, we were ready to roll! First, let’s talk about the book. I had read this particular one before, when little Miss I was around 3, and didn’t really like Apple pie back then — but she loved Amelia Bedelia. We first learned about this book series with Amelia as a little child, and I have to say I like her that way much more. I now know that the original series of Amelia Bedelia, by Peggy Parish, is about a house maid-nanny-cook that always takes things literally… getting herself in a lot of trouble. As a child she has the same problem, but she’s considerably more endearing. 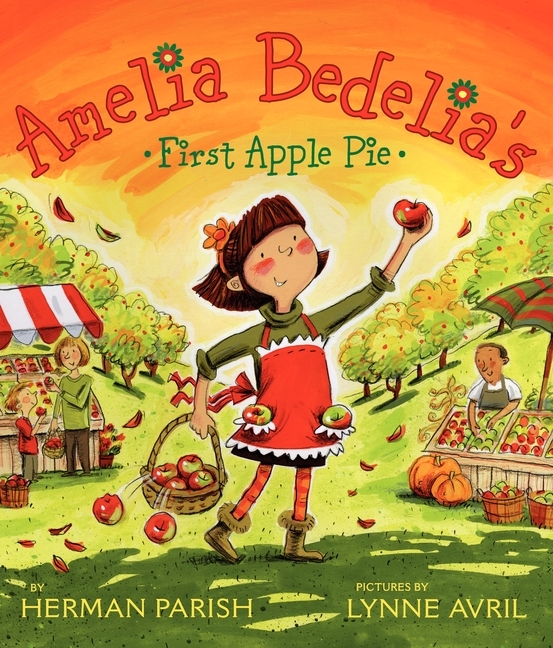 Amelia Bedelia’s First Apple Pie, written by Herman Parish (Peggy Parish’s nephew), tells the story of how Amelia’s Grandma teaches her to bake her first pie. It has the same staple misunderstandings of the Amelia Bedelia’s books, like when she “watches” her steps, or when she mistakes a flower for flour, but the story deals a lot more with being able to save the day by carefully watching Grandma and baking her own pie — which I feel is a lovely take away at the end. The book has its own recipe for Apple pie, but as I’ve been perfecting my own recipe, that’s the one I taught Little Miss I and her little friend Z, and it is also the recipe I’m sharing here. Place the flour in a big bowl and combine with the salt and sugar. Put the vegetable shortening in the flour mix and work with your fingers, combining the fat and the flour until the shortening is the size of small peas. Cut the chilled butter in small pieces and add to the flour mixture. Using a pastry knife or two butter knives together, cut in the butter until it is evenly incorporated and the fat resembles small peas again. Drizzle 1/3 of the chilled water over the flour mixture, then use a spatula or a wooden spoon to moisten the flour until a thick dough is formed. It should just hold together... if it doesn't, drizzle more water and work it well in the dough making sure you don't use your hands. Once the dough has formed, press down with your palms and divide it in two equal halves. Work each half in a 10 inch disk and wrap with plastic. Place in the refrigerator for at least half an hour, while you prepare the filling. I left mine in the refrigerator overnight and it was very easy to work with. Preheat oven at 425º F with the rack on the lower third of the oven. While you wait for the oven to be ready, peel, core and slice each apple in thin slices, about 1/4 inch thick. Place in a large bowl. Drizzle the lemon juice over the slices, and mix well. Sprinkle the sugar, ground cinnamon, ground nutmeg and salt over the slices, and mix well. Sprinkle the 3 tablespoons of flour on top of the apple mixture and mix until everything is incorporated, making sure not to bruise the apples. Let rest for at least 15 minutes to macerate, while you prepare the pie pan. Roll one disk with your rolling pin to about 13". Place on the pie dish, making sure there is at least a bit of dough hanging from the top of the dish. Pile the apples in the prepared pie dish, then distribute evenly. Dot the top of the apple mixture with little pieces of butter. Roll the second circle to about 11" to 12". Cover the pie with it. Crimp or flute the edges, making sure the bottom dough and the top dough are sealed at the edges. Cut vents in your pie! I usually do fun designs, either smiling suns, letters, or fall leaves. Use a sharp knife for doing this. If you don't cut vents, the filling will bubble over and spill. Sprinkle the top of the pie with ground cinnamon and crystal sugar sprinkles, or a mixture of sugar and cinnamon. Place in the oven for 30 minutes, then take out of the oven and place a cookie sheet with aluminum foil under. Reduce the oven temperature to 350º F.
Cook the pie for another 25 minutes, or until the filling is bubbling. Enjoy with your favorite ice cream or on its own! We made with the girls individual portions, using little pyrex dishes. If you want to do individual portions, the above recipe is good enough for 5 "mini-pies." Just divide the dough in 10 little rounds before putting in the refrigerator, and use 4 apples and a little less sugar and spices. Cook the mini-pies directly on top of a cookie sheet with aluminum foil, first for 20 minutes at 425º F, then 15 minutes at 350º. I love it that she is so excited to make pie. I loved Peggy Parish’s Amelia series in my classroom; it was always on my students’ favorite list. So glad that her nephew is continuing the character….these new books look just as appealing. Barbara, I like some of the Peggy Parish books, but sometimes Amelia as an adult can be very annoying for an adult (hilarious for a child, though). I much prefer what her nephew has done to the series. You should definitely check it out! I love that you are combining book reviews with recipes:) well, my hubby loves apple and he has been asking me to make a pie from scratch so I will be probably coming back to this recipe. Looks fantastic, thank you! Please let me know how yours turns out! I’ve been making this apple pie for many years now, and honed down the recipe to what you have here. It is my family’s favorite thing, and my daughter had a meltdown the other day when she realized her daddy had eaten the last piece! Thank you so much, Helen! I love cooking with my daughter, and she particularly wanted to learn how to bake the pie 🙂 And also thank you for hosting #FoodieFriday and the wonderful Pinterest board too! Very good for both of you! Some really nice looking pies! They were really delicious! And we had an encore with Thanksgiving last Thursday! Thanks for hosting #FoodieFriday and the wonderful Pinterest board too!